I was going to do my 2018 wrap-up today but I think I’ll do that next week. Next Tuesday is the first day of 2019 and that will be a good time to look back at all the calls I made over the past year and if any of them are poised to do something big in 2019, I want to remind everyone it’s time to have the copies to move when they pop. I think there are a quite a few long-to-medium-term picks I’ve made that are going to make us all some money. Today, though, I have to figure out what to talk about and I thought I’d mention something I found while exploring other sites, something I do sometimes. MTG Price’s tools are coming back with a vengeance next year and while peak MTG Price is my favorite go-to source for data, I do like to use other sites and encourage everyone to cast a wide net. Something that MTG Stocks does well is to flag things that have gone up a bit and could go up more and also flag big jumps you probably missed if they’re outside your wheelhouse or if a minor event pushed some amount of supply over a virtual cliff and triggered and avalanche. One such avalanche happened this week and it got me thinking about similar cards. As much as I like to deride people who only seem to talk about cards after they go up, that information isn’t always useless if you can apply it to similar cards that are waiting for a similar event to push them. Specifically, how much play does a card need to get in EDH to push its price if supply, if low (like for a foil or promo, for example) enough to trigger a precipitous increase in price? What card am I even talking about, for starters? Looking at the interests page on MTG Stocks, I found some interesting foil price changes in the past 24 hours. I’d check their site for a minute or two a day just so you don’t miss anything major. So what the heck is going on with Battle Hymn? I don’t know that fewer than 3,000 inclusions and no discernible new event could have done this. Is it speculation on new Gruul or Rakdos strategies? I’m not really much of an authority on competitive Magic anymore, so I lean on MTG Top8 the way I encourage people who don’t know EDH to use EDHREC. It’s not the be-all, end-all but I can usually figure out 90% of what’s going on just by searching for a card’s name on either or both of the two sites and since there are so many cards with potential, I tend to focus on other cards instead of really drilling down for that last 10%. Maybe someone on salvation or reddit or some secret Discord cabal where people who are bad at MTG Finance decide which terrible Visions card on the Reserved List they’re going to pretend was driven by EDH demand when they buy it out (This week it was Eye of Singularity) said something, but I don’t care. So, striking out on EDHREC, I checked MTG Top8. I don’t think it was a tournament event that I could find. It could just be a supply issue. The next thing I am going to check is that this price is actually correct. Looks like a TCG Player Buyout. Who knows why they did it? Check smaller sites to see if they have copies left for the old price since if that $16 doesn’t stick, it will likely stabilize halfway between the peak price and the old pre-spike price even if the spike was induced by some weird buying behavior. You can do that since you need to go to those sites to buy the cards anyway. I’m not about to talk about a card after it goes up then expect credit if you get copies at the old price, but I can hope to use this weird spike to help you find the next insane price bump. To do that, let’s look at cards from the same set and see if anything is getting more play in EDH and could see a similar bump if the same thing that happened to Battle Hymn happens. Back to EDHREC. 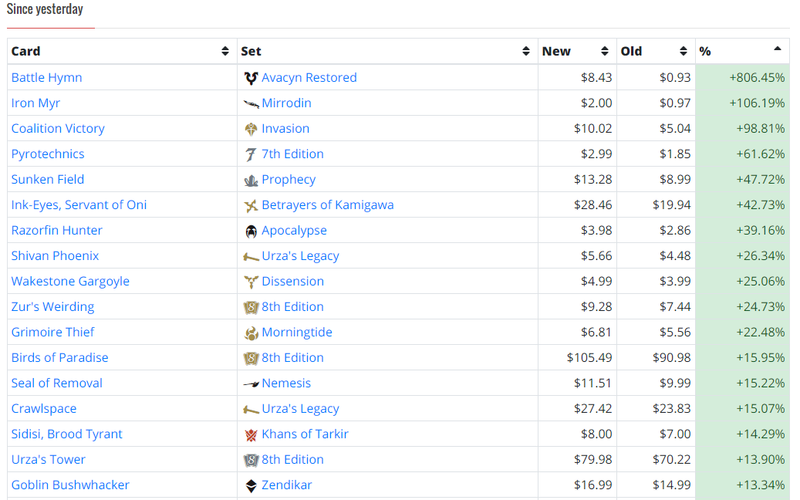 Using the “sets” tab, I am going to look at the commons and uncommons in Avacyn Restored and maybe a few older sets to see if there are any of those cards in more decks than Battle Hymn that need less of a nudge from an event outside of EDH and only have one printing to see if we can get ahead of the next weird buyout. If I’m missing an event and you know what it was that made Battle Hymn pop, leave it in the comments section. However, I’m operating under the assumption that what it was is immaterial if we can reasonably rely on it happening again to a card of similar or greater scarcity with similar or more demand. This will be fun. At just under the number of decks Battle Hymn is played in, Seraph Sanctuary is worth looking at. It has a reprinting but in a duel deck with no foil printing meaning it has only been printed in foil once. I think reprint risk is pretty low, this card has some utility and I think this could reasonably double. If you’re hoping to buylist after the spike, stay away, but if you have a retail out, this seems safe and low-supply. Every card in Avacyn Resored played more than Battle Hymn is rare, is Blood Artist or is Ghostly Flicker with multiple foil printings. That’s OK, I’m going to keep digging. This was an interesting find. 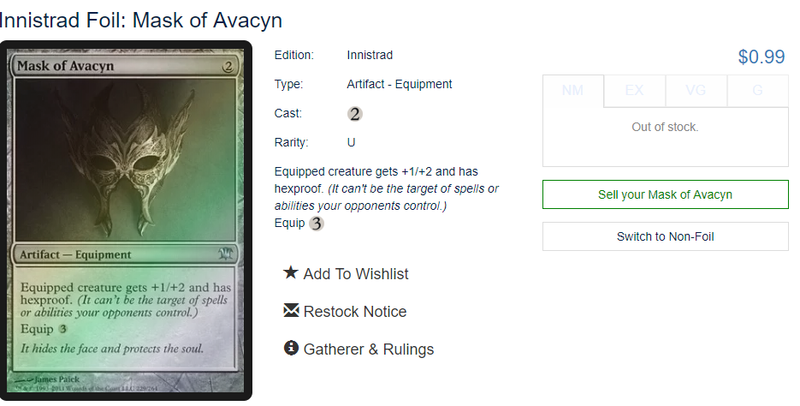 at 4,023 decks and no foil reprinting, Mask of Avacyn was curiously sold out on Card Kingdom. Off to TCG Player to look at price and supply over there. Here are the results. In summary, there are 26 listings, Near Mint foils start at $2.50 and $5 seems like a reasonable out. If Battle Hymn can mysteriously hit $15 as the result of a buyout, this card could climb near there and stay there on what appears to be organic demand. Some people still ship me non-foils in bulk do it’s worth discussing this card at least once this year so people know it’s a pick. Keep shipping them to me in bulk if you have been, though. I’m having another kid and college is expensive. Speaking of Innistrad equipment, here’s a card in more decks than Battle Hymn. 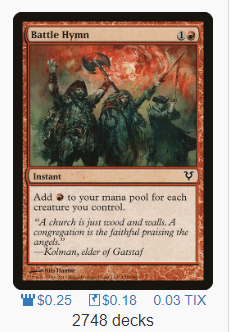 If it was mere EDH demand that drove Hymn, this could get above $5. I think this will be a slow, organic gainer, but I also think this is unlikely to get reprinted soon and I like it though less than mask. If Battle Hymn can maintain above $8, so can this. With Afterlife coming and introducing a bunch of Sprouting Thrinax variants into white EDH Aristocrats decks, I wouldn’t be surprised to see this go up sooner rather than later. We’re not looking at cards that much older than Hymn, but we’re finding stuff that is already “known” though is maybe undervalued. I expect Absorb to pop this week based on Ravnica Allegiance so why not this? For reference, Phyrexia’s Core, in fewer decks, is $10 on Card Kingdom. If Priest could go up based on Orzhov, guess what could go up based on Simic? Another $6 card that seems like it should be worth more. 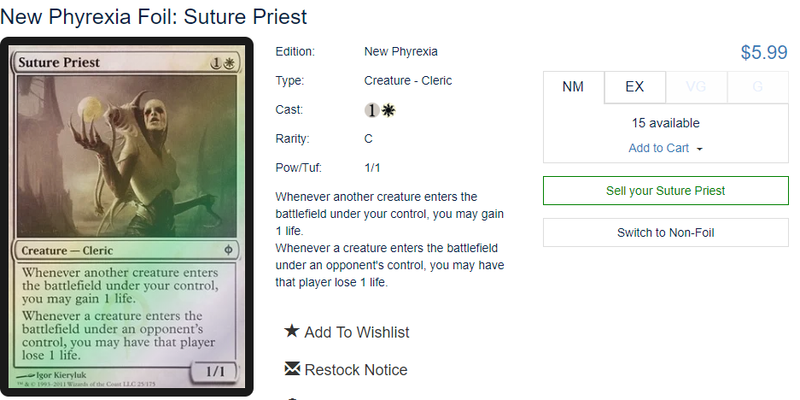 I’m comparing Priest and Drake to Phyrexia’s Core, which sees play outside of EDH a little bit but not double. I think Drake and Priest are sort of high buy-ins but supply is low and if 4 copies disappear, Card Kingdom activates their famous buylist and people take notice. I think the 34 listings on TCG Player vanish and then some jackass (me?) lists on for $25 on TCG Player, MTG Stocks gets triggered and some other me comes along and can’t figure out why Drake popped and writes an article about other cards in the same set that could be next to hit $15 and did I just become the kind of lazy financier I like to deride? I’m not telling you to do a buyout on Viral Drake. I’m not even pointing out it would be really easy to do it. 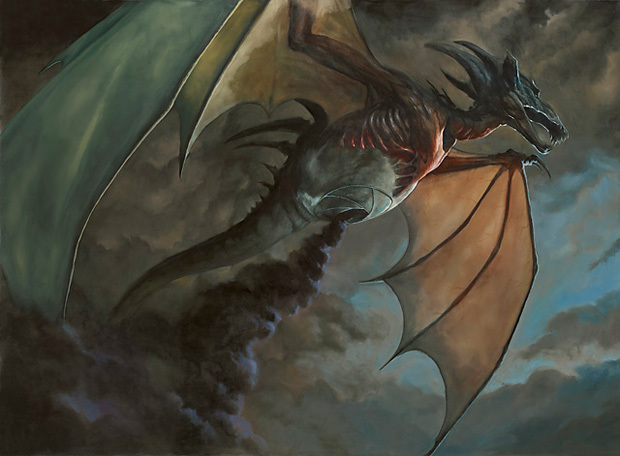 I’m stating I think Drake’s days are numbered as it is considering how it interacts with Simic Ascendency and other cards and I think 34 people wanting a foil in the next 3 months is reasonable and you’d rather be in at $6 ready to sell than in at $16 hoping to sell before they’re $12. There are more cards like the ones I found and you can use EDHREC to find them easily. Click the “sets” tab then click on a set and it will organize them from most EDH play to least and you can click on the individual card from that list to be taken to its EDHREC page where you can see the decks it goes in and click links to go to the price page on Card Kingdom and TCG player. If you’re going to buy, follow those links because EDHREC gets a cut and you were going to buy the card anyway. One last card I’ll mention because I like it and not because data supports it is this bad boy. It’s probably too late to affordably buy the foil and I am so bad at foil finance I didn’t even check when I tried to buy all of the non-foils a few months ago. However, they’re half as much on Card Kingdom as they are on TCG Player and I expect both prices on the non-foils are incorrect if this is a $15 foil. I like non-foils at a buck each quite a bit. I think this card is going places and I got a foil in bulk because people love to not have to look up prices on bad cards. Do it for them and let $15 foil uncommons make it worth doing. That does it for me. Check back in a week for my Best of 2018 pickstravaganza. Until next time!